Genealogy in America is getting even more interesting with the popularity of Japanese-American research. In Feb 1942, abt. 127,000 Japanese, two-thirds native born citizens, were removed to “relocation camps.” Of course the animosity toward Japanese and others of Asian descent did not begin with the 1941 bombing of Pearl Harbor. Anti-Japanese hysteria and paranoia were fueled by the early California Alien Land Laws of 1913 and 1920, and the Asian immigration prohibition of 1924. Even WWI Japanese American veterans were subject to imprisonment at the relocation camps. In 1945, Japanese Americans were allowed to return to the West Coast and in 1946 the last camp was closed. But their history includes imprisonment in racetracks stables and other temporary locations while waiting for the building of the ten relocation camps. Final Accountability rosters of Evacuees at Relocation Centers, 1944-1946).Final accountability rosters of evacuees at relocation centers, 1944–1946. Microfilm publication M1965, 10 rolls. Records of the War Relocation Authority, Record Group 210. 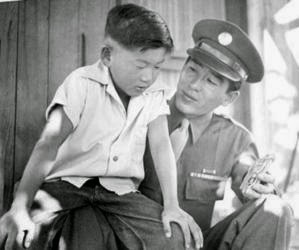 While families remained in the barbed wire camps, over 3,600 Japanese Americans from the mainland were released from their internment to serve in the US military. Be sure to read, FromJapanese Internment Camps to Combat, Part II, Nisei in European Theater for tips on researching Japanese soldiers in WWII.